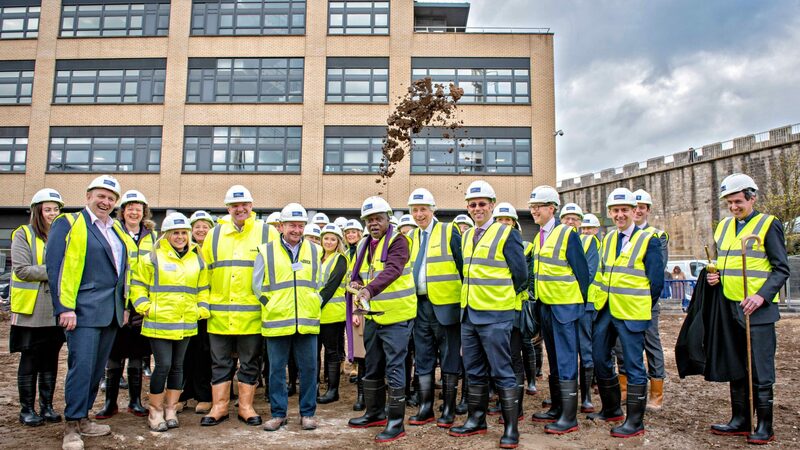 The Archbishop of York, Dr John Sentamu, has conducted a ceremonial groundbreaking on the Hudson Quarter site, in Central York to herald construction work starting. The Palace Capital plc owned site, located just off Toft Green, is being transformed into new apartments, office space and landscaped grounds which will create vibrant a new quarter in the heart of the City. The two-acre development on the site of the former Hudson House includes 127 luxury apartments, 34,500 sq ft of Grade-A office space and 5,000 sq ft of other commercial uses, located in four buildings around a landscaped central courtyard. Caddick Construction is the main contractor and is onsite now. Completion is expected by in spring 2021. Neil Sinclair, CEO of Palace Capital plc, said: “This is a major development for York and we are proud to have the Archbishop with us to formally start the construction work. “Caddick Construction is delighted to be here today to be part of this ground-breaking ceremony that will see a dormant site brought back to life in the heart of York. Construction follows full demolition of the previous buildings on the site, which were originally the British Rail offices. Hudson Quarter will also include a new landscaped link from the railway station, opposite the site, through to Toft Green.